Its Saturday afternoon and the weather is perfect in the Bay. The EP Kings just won the Currie Cup first division, I have my fire going and a couple of t-bones are waiting to go on the coals. What could be better? 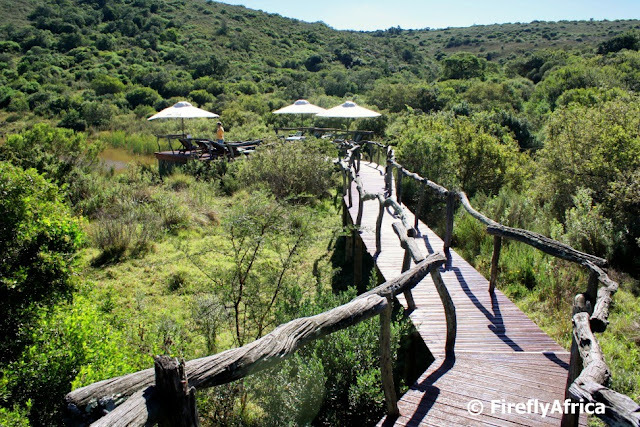 Not much other than perhaps spending this perfect afternoon on the deck at the bottom of this walkway at Mark's Camp at Lalibela Game Reserve. I like the idea of being surrounded by wildlife. And the steaks sound good too. OOO - that is MY kind of place! Heard so much about Lalibela - really need to go someday!